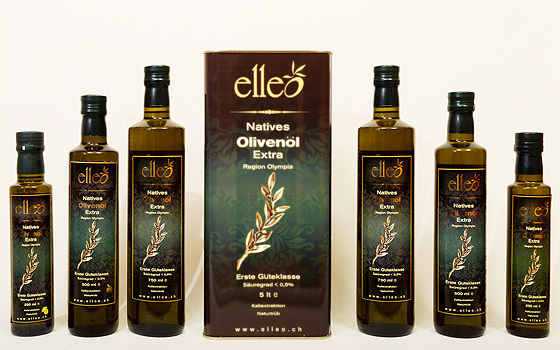 The extra virgin olive oil "ELLEO" always comes from the same olive variety (Koroneiki) and the same area. It is produced by cold pressing (at room temperature), which is applied at all stages of the oil extraction, in order to maintain at high levels the sensitive qualities of the oil produced. 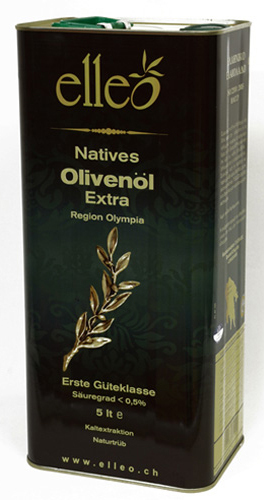 Olive oil of superior quality, with perfect aroma and flavor, which is taken from the first pressing of the healthy olives and only with natural-mechanical methods , with no process at all and no chemical intervention. Moreover, we haven’t removed with filters or other methods precious ingredients, such as its natural margarine, which offers extra-virgin olive oil "ELLEO" the unbeatable taste, the aromas, its natural color and lots of nutrients. In 5 liter tin cans, extra virgin olive oil, of the famous local variety 'Koroneiki' pure as it comes out of our oil-press. It doesn’t contain any mixings and it hasn’t undergone any other process. In 750ml glass bottle, extra virgin olive oil, of the famous local variety 'Koroneiki' pure as it comes out of our oil-press. It doesn’t contain any mixings and it hasn’t undergone any other process. In 500ml glass bottle, extra virgin olive oil, of the famous local variety 'Koroneiki' pure as it comes out of our oil-press. It doesn’t contain any mixings and it hasn’t undergone any other process. In 500ml glass bottle, extra virgin Bio olive oil, of the famous local variety 'Koroneiki' pure as it comes out of our oil-press. It doesn’t contain any mixings and it hasn’t undergone any other process. In 250ml glass bottle, extra virgin olive oil, of the famous local variety 'Koroneiki' pure as it comes out of our oil-press. It doesn’t contain any mixings and it hasn’t undergone any other process. In 250ml glass bottle, extra virgin olive oil with lemon scent, of the famous local variety 'Koroneiki' pure as it comes out of our oil-press. It doesn’t contain any mixings and it hasn’t undergone any other process.